Your New Holland Motor Grader works hard, and so do you. You depend on your equipment, and your equipment depends on its tires. 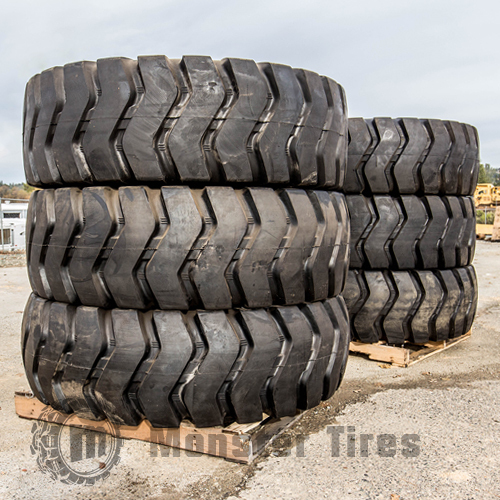 If you are looking for Construction Tread Tires for New Holland Motor Grader, you have come to the right place at Monster Tires. We have a full range of New Holland Motor Grader Tire Size Options, including RG200 Motor Grader Tires, RG170 Motor Grader Tires, RG140 Motor Grader Tires, RG100 Motor Grader Tires, and RG80 Motor Grader Tires. First Class Service and Staff Support: One of the most common reasons for motor grader tire returns is that the buyer buys the wrong size or model of tire. We don’t want that to happen to you. Let our expert staff help you select your OTR Tires for New Holland Motor Grader, and you can rest assured that they will fit and work hard for you. We offer High-Quality OTR Tires for construction companies and home owners. We are experts in this subject and passionate about providing Heavy Equipment Tires to get your piece of equipment rolling again. Trust in Monster Tires for your next set of New Holland Motor Grader tires!